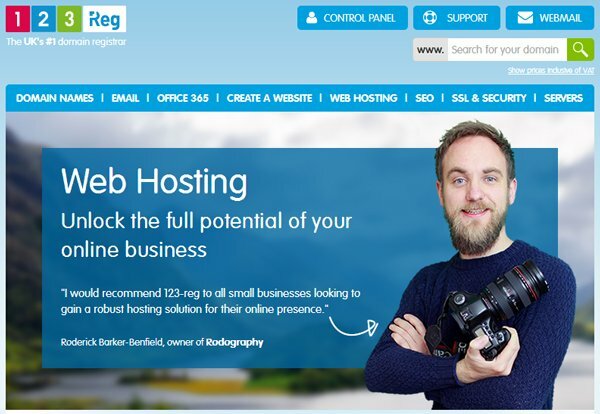 123-Reg are far better known for their domain registration services than anything else, and in my earliest days of building and managing websites, they were always my go-to provider for low cost domains. So when the company began to expand in an attempt to give one-stop-web-shop services like GoDaddy a run for their money, I had no doubt that they’d do just as good a job with their web hosting, and ultimately save me the time and hassle of hosting my website with one company and registering my domains with another. Sadly, that wasn’t quite the case, and in the following review of 123’s mid-level shared hosting plan, I’ll explain in the following review. With the majority of the web hosting reviews on this site, you’ll see that I normally focus on the entry level package, but we’re not going to do that today. 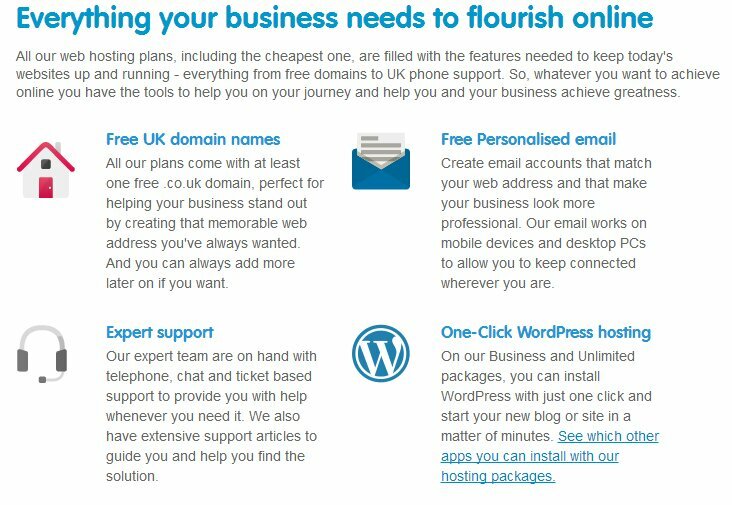 For the sake of a fair, accurate comparison with those other web hosts, I thought it better to center my review around the £2.99 Business package, as this offers better value for money than the basic Essentials plan without costing as much as the expensive “Unlimited Deal”. Though I say the Business plan represents better value for money than Essentials, that isn’t actually saying all that much when you consider that 123-Reg are pretty stingy with their hosting offers, especially when considered alongside comparatively priced “unlimited everything ” deals offered by their competitors. Sure, the option to host multiple websites is included, but you’re limited to a maximum of five, with only 100GB of storage space to divide between them. Again, this is pretty poor when you can get unlimited space for as many sites as you like for a similar price with other hosting providers. The good news at least, is that unlimited bandwidth is a standard feature across all of 123-Reg’s hosting plans, so you’ll never have to worry about your website slowing down or going offline completely when there’s a big demand on server resources. – 500 x domain-based email accounts. Whilst I’d bemoan the fact that other companies offer unlimited mailboxes, I’m not sure that’s much of an issue here, since the kind of customer likely to be interested in a 123-Reg hosting account is unlikely to need more than the 500 that come complete with this Business hosting plan. Each mailbox comes with 1GB of storage space for your messages, anti-virus and spam filters, and as many email forwarding addresses as you could possibly need. 123-Reg’s included domain name deal can be a little confusing for newcomers. Their sales page promises two free domains included within the price tag, though on signing up, you’re only asked to register one. It’s only later on, once you’re in the management of your account, that you find the option to secure a second one at no extra cost. That aside, I do think that having two free domains somewhat makes up for the less-than-generous package offer, but even then, the company don’t exactly shine here. The majority of shared web hosting companies may only offer a single domain, but they’re good enough to make .com one of the top-level domain options. With 123-Reg, you’re limited to a .co.uk. Whilst this may be fine if you’re only planning a small, Britain-based business, if you had dreams of reaching a global audience, or in at least securing the .com version of your name to prevent it being snapped up by someone else, you’re going to to have to pay for those separately. This will only add to the cost of developing your web presence, another blow to anyone looking for a low cost approach to hosting from 123-Reg. If I was running the kind of hosting reviews site that awards grades for various elements of a package, I’d likely give 123-Reg a B for effort but a C for execution when it comes to using their shared web hosting packages. The actual process of signing up and registering a hosting package was as straightforward as it is with any other company, in some cases even better because it gives you the option to choose between Linux or Windows based hosting options without it altering the cost of your fee, something you don’t see with 123-Reg’s competitors. For beginner-level website owners and basic websites, I’d recommend Linux hosting. Whilst Windows certainly does everything Linux can do, it’s normally reserved for more powerful websites, and you’ll likely have a much easier time by sticking with Linux. Once logged in, I found the control panel very easy to navigate, with separate sections for website creation, eCommerce, account management and other website essentials such as security, marketing, and monetisation. Each section contains a number of tools and services represented by clearly marked icons. I’ll give the company full marks for making basic tasks a breeze, but knock them down a notch for making general web hosting tools a little bit of a pain to find. If you want to configure your FTP account or use the online file manager, you’ll find these tucked away in a separate tab which in my opinion isn’t quite as prominent as it should be. 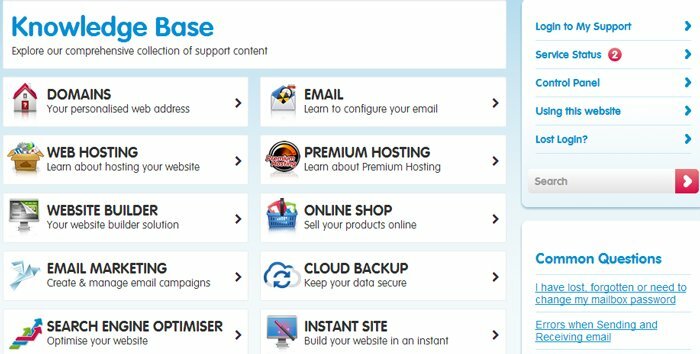 Overall though, I’d say that whilst beginners may need a little longer to get to grips with their hosting account, to anyone with even basic web hosting experience, everything here should look familiar and pose no serious problems. Though the company may be pretty underwhelming in almost all areas of their hosting account, I do have to give them credit where it’s due; their cloud-based shared hosting solutions do make them one of the more reliable options around. Making use of load-balancing technology, the company hosts your website across multiple servers, so that if there’s an issue with one piece of hardware, the others will pick up the slack and keep your site performing at its best 24/7. As you’ll see from my own performance tests in the right-hand column of this review, my 123-Reg hosted website never dropped below 99.9% uptime during the six month trial period, and more often than not hovered just below the 100% mark. As with most of their competitors, the company offers a range of apps for both their Linux and Windows hosting plans, all of which provide the opportunity to install powerful Content Management Systems and web building tools on your hosting server. All the usual suspects are present and correct here, with the Big Three CMS platforms (WordPress, Joomla, and Drupal), available alongside the likes of Concrete5, Mambo, b2evolution, and the Typo3 blogging platform. 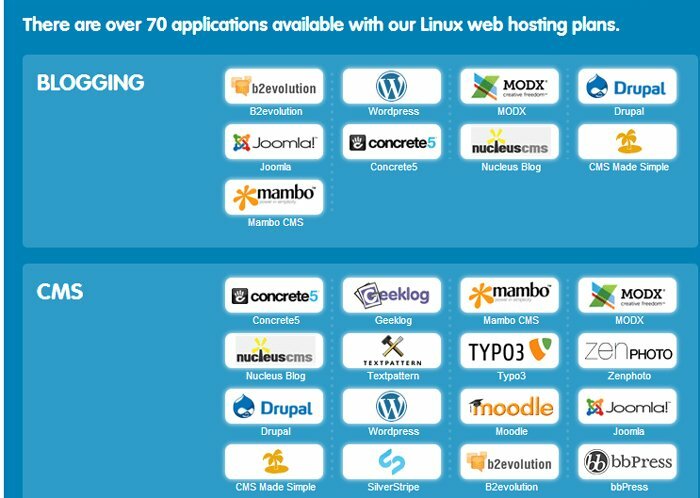 In total, Linux hosting plans boast 70 different apps to help you create everything from eCommerce stores (more of which later) to Wiki sites and forums, with other apps on offer to manage advertising, website analytics, and surveys. On the other hand, Windows hosting comes complete with just ten basic apps, as shown in the image below. On the face of it, this doesn’t surprise me too much as -like I said earlier- Windows servers are typically designed for more advanced projects that need more than just a basic app to function. Bitmap editor ImageMagik, PHP enhancer Zend Optimiser, and GhostScript are also pre-installed into your plan. 123-Reg’s own Instant Site web builder. To be honest with you, I wouldn’t recommend this option, as I really don’t think it offers good value for money when compared to similar packages offered by other web hosts. Opt for the basic £4.99 Instant Site package, and you’ll not only have just a single email account, but also be stuck with 123’s own branding on your site. To remove that, you’ll need to upgrade to the mid-level £9.99 package, which also offers additional features such as automated site backups and a whopping three email addresses. Having trialed the company’s website builder for a project a while ago, I can at least say that it’s very easy to use and does offer some decent templates, but like I said, you can do make better looking sites using drag-and-drop elsewhere, and much cheaper. 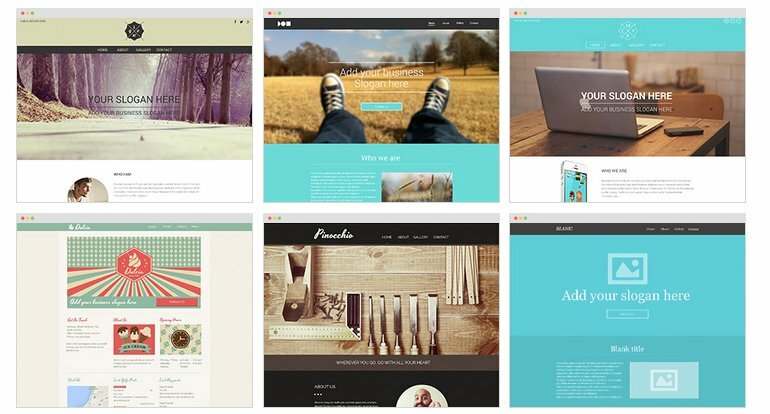 One good thing of the brand’s web building offer is that they do provide you with a range of downloadable website templates, which you can either then hand-code, or re-upload via FTP or your file manager and edit from the site itself. It’s a confusing, laborious process, though -much as with Instant Site- the end result is often decent if hardly spectacular. If you are planning on using 123-Reg to build a website then, I’d recommend using the applications available rather than trying to go it alone with any of the company’s in-house products. With so much competition out there, effective marketing of your new website can ultimately mean the difference between success and failure. Most web hosting companies understand this all too well, often incorporating tools and services to help you promote your site and reach new customers. After all, the better your site does, the more likely you are to stick around and keep paying for hosting. It used to be the case that most top hosting providers would bundle together free advertising credits and other tools into a comprehensive marketing suite, though such packages are becoming frequently less common, and are non-existent with 123-Reg unless you opt to pay for one of their expensive marketing services. The company offers three distinct packages for email marketing (prices range from £4.99 – £18.99 per month), Search Engine Optimisation (£9.99 – £14.99), and pay per click advertising (prices not disclosed). Though I didn’t trial any of these services personally, I can say that, from the features list, they do seem to represent decent value for money for business owners who lack the necessary time or know-how to market their website. For those with a little more experience, or at least who are willing to learn, there doesn’t appear to be much 123-Reg can do for you that you couldn’t do for yourself, either with the tools provided in your hosting plan, or -in the case of email marketing- through services like Mailchim, Aweber or Automizy. What the company do have working in their favour is their range of Youtube videos like the one we’ve posted above. These provide useful, practical hints and tips on topics such as SEO and social media marketing, and work well as an introductory-level course on promoting your site. Web analytics packages help you to understand how users are finding your website, so that you can optimise content to attract more customers. 123-Reg’s hosting plans come with several options included, such as Tracewatch, SmarterStats, and Open Web Analytics. There’s even a simple generator for creating Google Sitemaps, something which is vital if your site is to stand any chance of success in being found on the world’s most widely-used search engine. If you’re planning to launch an online store with 123-Reg, you’ve got a couple of options available to you, though most of the better ones actually involve the aforementioned Instant Site, or a separate -albeit similar- store builder package, which will set you back anywhere between £14.99 (ten products) to £49.99 (unlimited products) per month. To create an eCommerce using your hosting plan, you’ll have access to leading shopping cart platforms like ZenCart and osCommerce, along with support for PayPal intigration and support for all the major payment gateway tools. To make use of an SSL certificate for secure transaction processing, you’ll need to upgrade to the company’s £6.99 per month unlimited plan which also removes the restrictions on the amount of disk space you can use. Despite what I said earlier about this particular package, I do think it’s worth a serious look for those interested in starting a web store, as the £6.99 price tag for unlimited space and an SSL certificate actually works less than similar products, such as the Premium package I recommended in my HostGator review. If you’ve read other 123-Reg hosting reviews before this one, you may have found the reviewers bemoaning the lack of telephone support. It’s important to note here that those reviews are likely to be from outside of the UK, as a telephone service is operational here in this country, along with the usual live chat and email/ticket support system. As I always do when reviewing a new hosting company for this site, I tested all three options and was happy enough with the responses I received. The time it took to connect to an agent via phone and live chat was fairly standard compared to other companies, though email did take a little longer than most. The quality of support I received was good; each agent was helpful in guiding me step-by-step through a number of problems and explaining things in a clear, simple style that a non-tech-savvy customer would no doubt appreciate. My only gripe with the customer service is their limited hours of operation. Whereas many of their competitors offer 24×7 support, 123-Reg’s support team are only available between the hours of 9am -7pm. If you’re working on a website project in the evenings after spending the day at your normal 9-5 job then, you’re going to have a pretty limited window of opportunity to access support. It’s frustrating, and in my opinion goes against the company’s ethos of catering to small business owners, especially those handling their website management outside of standard office hours. Where 123-Reg does at least redeem itself is in its vast and very well laid out knowledge base of guides and tutorials. From spending a decent amount of time reading through these, I can say with some confidence that there’s hardly anything you could want to do with your web hosting package that isn’t covered. With everything placed into well defined, easy-to-navigate categories, the knowledge base is certainly one of the brand’s strong points, and proves especially useful if you need help outside of the customer support team’s opening hours. 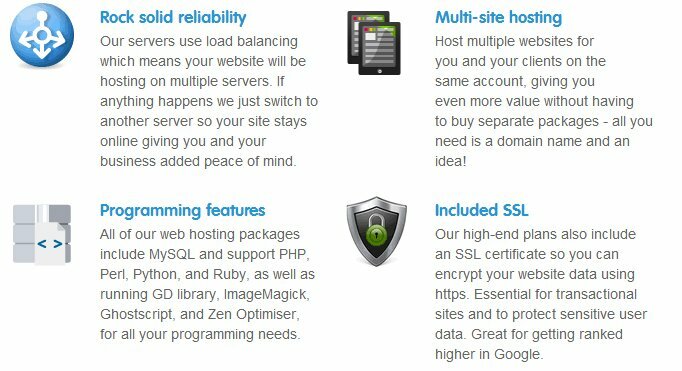 123-Reg’s web hosting packages are certainly not the worst I’ve ever seen, but sadly, that’s about the biggest compliment I can pay them. Though there’s nothing they do that’s outright terrible, there’s nothing that they particularly excel at either. at least not until you go back to what brought 123 Reg to the dance in the first place. The company still does a great job of domain registration and management, and I’ll still be using them from time to time for that exact purpose, but when it comes to web hosting, other top hosting providers offer better, more affordable hosting solutions.